Misinformation Monday, no. 10. | Scuffalong: Genealogy. Misinformation Monday, no. 10. – Scuffalong: Genealogy. Another example of the pitfalls of unquestioning acceptance of federal population schedules at face value. What you see (1) may not be what it seems and (2) is not all there is. 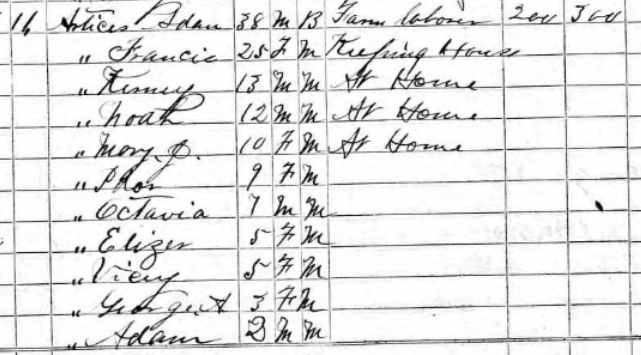 Here, I follow my great-great-great-grandfather Adam T. Artis over the arc of his life, as recorded in census records. Adam Artis was born in 1831 to a free woman, Vicey Artis, and her enslaved husband, Solomon Williams, most likely in Wayne or Greene Counties, North Carolina. 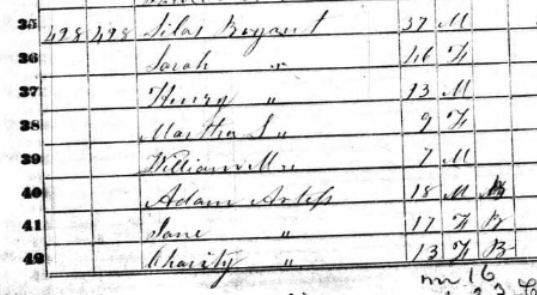 In the 1840 census of one of those counties, he, his mother and siblings are anonymous hashmarks under the heading “free colored people” alongside the name of a white head of household. White farmer Silas Bryant is the head of household. The other Bryants are presumably his wife and children. The significance of Adam Artess, Jane Artess and Charity Artess’ names listed below requires knowledge outside the four corners of the page. As I learned via subsequent research, Jane and Charity were Adam’s sisters. (Their mother and remaining siblings were listed next door at #429.) Though no bonds or other indenture documents survive, it is most likely that the Artis children were involuntarily apprenticed to Bryant until age 21 by the Greene County Court of Pleas and Quarter Sessions. Adam’s age is correct, so I assume that Jane’s and Charity’s are, too. The censustaker evinced some hesitation in describing Adam’s color, appearing to superimpose a B (black) over an M (mulatto.) This is a matter of some concern to descendants who deny that he was of African descent. No photographs of Adam survive, but his great-granddaughter D.B. told me she recalls seeing one in her childhood. It was later stored in a barn and ruined by rainwater. Adam, she said, was brown-skinned. Mulattohood was in the eye of the beholder, but I think it is safe to say that Adam had considerable African ancestry. The first entry is found in the enumeration of Holden township, Wayne County. The second is in Nahunta. The first was taken 18 August by William R. Perkins. The second, 23 September. By William R. Perkins. I can’t begin to explain why Perkins rode the backlanes of northeast Wayne County twice and — in two different handwritings — recorded the same people living in the same houses as residents of different townships. Substantively, though, with a couple of exceptions, the two households attributed to Adam Artis are quite consistent. Adam and his wife Frances (Seaberry, whom he married in 1861) are shown with nine children whose ages are identical in both listings. The last six children were born to Frances, and some of their names take a gentle mauling between records. The oldest child was Ida, which is close to “Idar,” but not at all to the very modern-sounding “Jaden.” And who was Octavia/Tavious, a seven year-old male? Process of comparison and elimination identifies him as Napoleon Artis, often called Dock. Was Octavius his middle name? I’ve ever seen it used in any other place. “Artice” is an alternate spelling of Artis seldom used by Artises themselves, but occasionally adopted by those recording them. In this record, two of Adam’s children with Frances, Walter and William, were still unmarried and living at home, but the remaining children are Amanda’s. Don’t be fooled by the absence of the infant Alberta. She survived her mother’s untimely death and was taken in by her half-sister Louvicey Artis Aldridge, who, presumably, nursed her along her own babies. There is no 1920 census entry for Adam T. Artis. 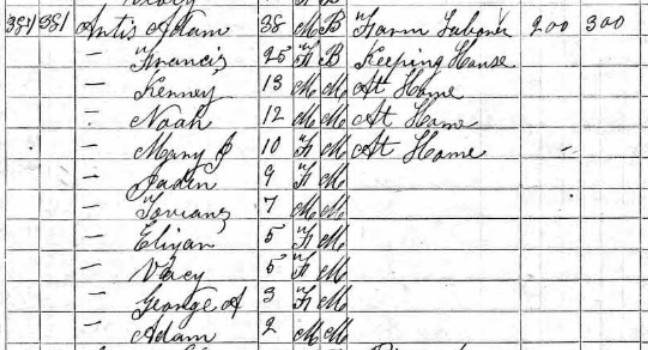 This father of nearly 30 children (23 of whom are listed with him in census records) and husband or partner of five (only two of whom show up in the census) died the 11th day of February, 1919. → The leading colored funeral director. ← A burned barn, an old well, and Officer Smith.